Well, of the whole National Blog Post Month is over for me. Whew. I tried this a couple of years ago and it may be a couple more years hence before I do it again. Maybe! You never know. 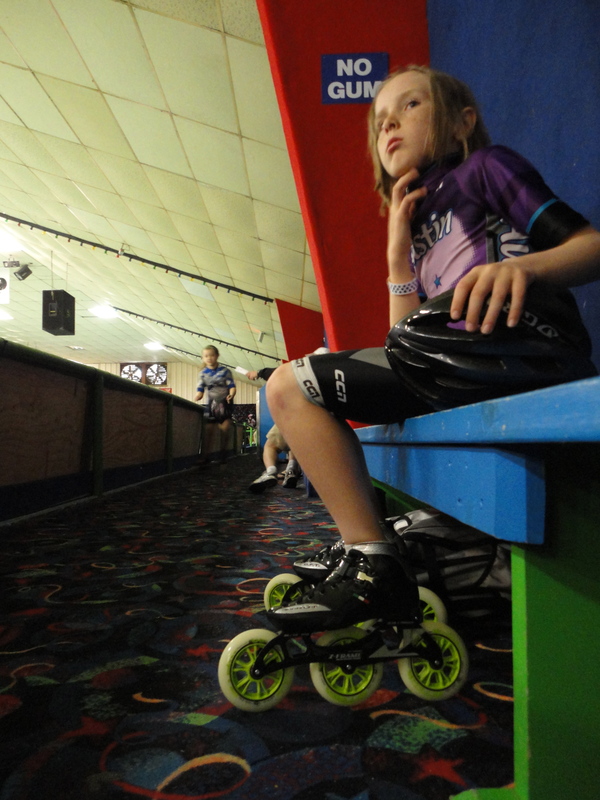 In the meantime, I’ll be hanging out at the roller rink because that is what I do. There was a time when I thought the strangest place I’d ever written was in the car, sitting with my laptop on the way to Thanksgiving dinner. Now, I write at the roller rink while my son skates. The first time he put on a pair of roller skates was at a birthday party. We rented the quad skates (you know, traditional skates), and he got on the rink and fell. He fell. He fell. He fell. He cried. He fell. He wanted to go back. We went back, and eventually he managed to stay up all the way around the rink. Then he saw Rollerblades. We rented Rollerblades. He didn’t fall so much. He got faster. 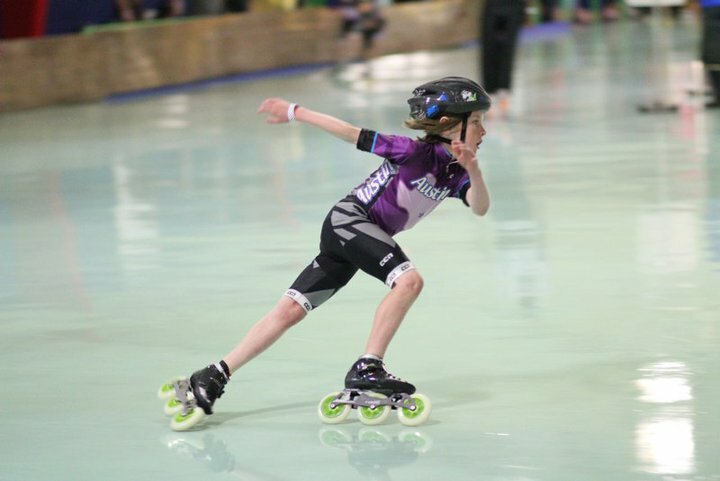 He began participating in the open session races–the races during regular public skates times, races that are just for fun, and where most participants stumble along and barely stay up. He began winning all those races–until speed skaters showed up. Mr. Rollerskates (yes, that’s what all the kids call him and he gives skate lessons) encouraged my son to talk to the speed skate coach. The coach said he’d seen him skating during open session, and sure, he could come watch a practice any time. I rather hoped that the first time my son saw a serious spill, he’d change his mind. The coach lent us a pair of speed skates (because they are insanely expensive and you want to be sure you’re going to stick with it before spending that kind of money). My son goes to every practice–4 days a week. Usually two hours at a time. Practices are boys, girls, women, and men. Ages 5 to 50. At meets you only get a medal if you place. Lots of kids and grownups go home without medals. They don’t give ribbons or anything for showing or participating or for being a good sport. If you win, you get your medal (sometimes trophy!). If you lose, then practice more. He has fallen and lost skin. He has fallen on his face. He has been kicked by skates. He has seen other skaters lose skin to the floor. Bloody patches the size of a baseball. Bruises. Twisted ankles. Pile ups. Crashes into walls. My nerves are getting stronger. Speed skating is not a popular sport around here and most people have no idea what we’re talking about. My son is the only kid at his school who speed skates. Roller skate, sure. Other parents look at me as if I’m nuts. And there is no skate season. Skate practice is all year round. But you can see the writing metaphor here, can’t you? You start writing. Stories fail. You keep writing. You practice regularly! You might win–publication! You might (most likely) get nothing. Practice more! And other people will look at you as if you’re nuts. You may not literally bleed (should hope not! ), but metaphorically you will. And it’s all year round. What isn’t all year round (thank the merciful heavens) is Story-a-Day May. But that crazy month is over and I’ve written story 31! This doesn’t mean I’m done writing stories, of course. (Of course!) But tomorrow starts The Summer of Submission. Write. Edit. Submit. Write. Edit. Submit. Write. Edit. Submit. Around and around we go. What are you submitting these days? Come on. Put on your crash helmet and go! Congratulations on reaching the end. Keep going – definitely! Job well done for a difficult and challenging task. You can be proud of what you’ve accomplished and know you’re a better writer than when you started, even if the improvement doesn’t show just yet. It will. Even if it’s only because you forced the discipline to write daily, to keep your hands moving for whatever you could manage, that’s growth. Positive, definitive, quantifiable growth. Thanks, Darc. Now I hope I can do something more with these stories. I love this story about your son. It is a perfect metaphor for writing and trying to publish. You did so well with Story a Day! For me, I’ve got a good-sized pile of stories now that the month is over (around 18, I think?). I am looking forward to a solid round of editing and submitting now, too. It’s going to be a great summer. 18 is awesome! The point is to write after all. Are you going to enter the contest? I’m going to give it a try. You should too. And yes, it is going to be a great summer! Good luck with what comes next. And he sounds like he has a love for the competition too. Did he win something at this event? At the event photographed he won a trophy for 2nd place overall. At the even this last weekend–which was regionals and much more competitive–he won a medal for 3rd place overall. And he won a 2nd place medal for a relay. The coaches think he has a lot of potential. But as proud as I am of him, I’m glad he’s active and has found something he loves and is dedicated to. And he is very competitive–often times more competitive than I’m totally comfortable with.